Three days ago, an abused two-year-old Lhasa Apso was surrendered to the Maricopa County Animal Care and Control in Phoenix, Arizona. In addition to having matted, filthy fur, the poor pup was also covered in maggots which were eating away at a leg injury. Because of the dog’s poor condition, staff rushed to get him into urgent medical care. They also took down the information of the person who surrendered him in such ghastly condition, reports One Green Planet. That’s not the worst of it, however. While the dog was being groomed — likely the first time in months, the dog’s leg FELL OFF from his body. You can imagine the staff’s horror. Reportedly, the leg was so badly infected from the injury and the lack of circulation that it could hold on no longer. Immediately, the frazzled groomers rushed him to Dr. Steve Gilson of Pet Urgent Care, LLC for treatment. There was no other option but to amputate the dog’s leg, so that is what the veterinarian did. 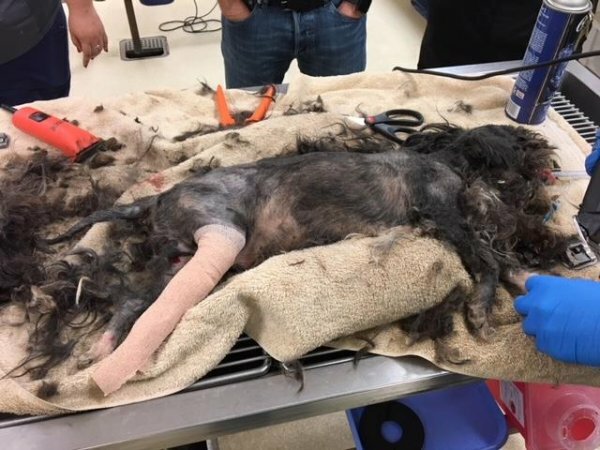 The Maricopa County Animal Care and Control shared the terrifying story on Facebook to raise awareness about the dog’s situation and to hopefully find him a home. The organization also gave thanks to Two Pups Wellness Fund. The non-profit provides financial aid for abused and neglected animals, and covered all of the dog’s medical expenses. The Lhasa Also was named Chance and is now recovering. In about two weeks, he will be ready for adoption. Understandably, the pup is timid. But with the right family, love and support, he will likely learn to trust humans again and enjoy his life. If you or someone you know is interested in adopting Chance when he has recovered, please click here. The pup is currently at the Maricopa County Animal Care and Control’s west shelter and his ID# is A4007448.
? Ancient Hidden Knowledge– What Do Halos Really Represent? 11-Year-Old Scientist Invents Device That Can Detect Lead In Water ?